In recent times, it has been recognized that Vitamin D deficiency is very common, especially in South Asians. Indeed, it is estimated that around 1 billion people worldwide have Vitamin D deficiency. Despite adequate sunlight throughout the year, lack of Vitamin D (the sunshine Vitamin) in India is reaching epidemic proportions with a prevalence of >70% in the general population. Vitamin D helps in regulating the normal functioning of pancreatic beta cells, and low levels of Vitamin D has been reported to be associated with the T2D. The activity of vitamin D is mediated through the Vitamin D receptor (VDR) which is a member of the thyroid hormone receptor family. The significance of this hormone in general wellbeing and in the prevention of chronic disorders is increasingly being recognized. In humans, the gene encoding VDR is mapped to chromosome 12q13-14 region, has 11 exons and together with mediating introns spans roughly 75 kb. Until date, several polymorphisms of VDR gene have been identified and the most commonly studied VDR polymorphisms (single nucleotide polymorphisms [SNPs]) are FokI (T/C; rs2228570), BsmI (A/G; rs1544410), ApaI (A/C; rs7975232), and TaqI (C/T; rs731236). Several genes have been identified as a risk factor for T2D. Recently, polymorphisms in VDR gene have been found to be associated with T2D. A study conducted in the French population showed an association of TaqI polymorphism with obesity and early-onset T2D. BsmI and FokI polymorphisms have been reported to be associated with diabetes in many studies.,, A recent Indian study done in Kashmir Valley reported a strong association of TaqI and BsmI polymorphisms with T2D and another North Indian study also showed that the combination of VDR genotypes is associated with the risk of T2D. Besides, participants with PD and low circulating 25(OH) D concentrations are reported to be the most insulin resistant and have impaired β-cell function. Homeostatic model assessment for Insulin resistance (HOMA IR) (a marker of insulin resistance) was also shown to be associated with VDR gene polymorphisms in individuals with PD. However, there are some studies which do not show any association of VDR polymorphisms with T2D., These differences are likely due to ethnic or other differences. This underscores the importance of studying VDR polymorphisms in different ethnic groups. Till date, very few studies have been conducted in Asian Indians highlighting the link of VDR polymorphisms with the diabetic phenotype., Thus, the aim of this study was to investigate the association of VDR gene polymorphisms (TaqI, BsmI and FokI) with PD and T2D and their relationship with anthropometric and biochemical parameters in Asian Indians. A total of 454 individuals from a tertiary care center for diabetes were recruited for the study after obtaining approval from the Institutional Ethics Committee of the Madras Diabetes Research Foundation. The study participants included those with normal glucose tolerance (NGT; n = 147), PD (impaired fasting glucose (IFG)/impaired glucose tolerance (IGT); n = 145) and (T2D; n = 162). Those who were confirmed by fasting plasma glucose value ≥126 mg/dl and oral glucose tolerance test to have 2 h plasma glucose value ≥11.1 mmol/L (200 mg/dL) or more based on the World Health Organization criteria were diagnosed as having diabetes. Participants with IFG and IGT were considered as PD in this study. IFG was determined with fasting plasma glucose value ≥6.1 mmol/L (110 mg/dL) and <7 mmol/L (126 mg/dL). Those with fasting plasma glucose value ≥7.8 mmol/L (140 mg/dL) and 2 h postglucose value <11.1 mmol/L (200 mg/dL) were diagnosed with IGT, and individuals those with fasting glucose value <6.1 mmol/L (110 mg/dL) and 2 h postglucose value of <7.8 mmol/L (140 mg/dL) are considered as having NGT. Anthropometric measurements including weight, height, and waist measurements were obtained using standardized techniques. The Body Mass index (BMI) was calculated as weight (in kg) divided by the square of height (in m). Blood pressure was recorded from the right arm in a sitting position to the nearest 2 mmHg with a mercury sphygmomanometer (Diamond Deluxe BP apparatus, Pune, India). Two readings were taken 5 min apart, and the mean of the two was taken as the blood pressure. The total percentage of body fat was measured using a calibrated body fat composition analyzer (Tanita Analyzer). From all the participants, fasting blood samples were collected for measurement of a wide variety of biochemical tests. All biochemical assays including measurement of fasting plasma glucose (hexokinase method), serum cholesterol (cholesterol oxidase–peroxidase–amidopyrine method), serum triglycerides (glycerol phosphate oxidase–peroxidase–amidopyrine method) and high-density lipoprotein (HDL) cholesterol (direct method–polyethylene glycol–pretreated enzymes) were measured using Hitachi-912 Autoanalyzer (Hitachi, Mannheim, Germany). Low-density lipoprotein (LDL) cholesterol was calculated using the Friedewald formula. Glycated hemoglobin (HbA1c) was measured by high-performance liquid chromatography using the Variant machine (Bio-Rad, Hercules, California, USA). A structured questionnaire which including information on lifestyle, family history, and physical activity details were also taken after obtaining informed consent from all the study participants. Whole blood samples collected using EDTA as an anticoagulant was used for isolating genomic DNA using the phenol-chloroform method of DNA extraction. Extracted DNA was stored at-80°C for further experiments. The concentration and purity were estimated by optical density measurement at A260 and A280 using Nanodrop. Polymerase chain reaction (PCR) amplification was carried out in 15 μl reaction mixture-containing genomic DNA (100 ng), 200 nM dNTPs, 1.5 mM Mgcl2, 0.5U of Taq DNA polymerase (New England Biolabs [NEB], Inc., and 5 pmol of each primer per tube in a gradient thermal master cycler (Applied Biosystems, Thermo Fisher Scientific, USA). PCR amplification of 745 bp of Taq I, 825 bp of Bsm I and 265 bp of Fok I was carried out using the following primers F 5'-CAG AGC ATG GAC AGG GAG CAA-3', R 5'-GCA ACT CCT CAT GGC TGA GGT CTC-3'; F 5'-CAA CCA AGA CTA CAA GTA CCG CGT CAG TGA-3', R 5'-AAC CAG CGG GAA GAG GTC AAG GG-3'; F 5'-AGC TGG CCC TGG CAC TGA CTC TGCT CT-3', R 5'-ATG GAA ACA CCT TGC TTC TTC TCC CTC-3', respectively.,, The amplified PCR products were digested with 2 units of each TaqI (NEB) at 65°C, BsmI/Mva1269I (Thermo Fisher Scientific) at 37°C and FokI (NEB) at 37°C and kept for overnight incubation. These digested products were resolved on 3% agarose gel stained with ethidium bromide using gel electrophoresis system at 100V for 1–2 h and the gel was visualized under ultraviolet light using BioRad gel doc system [Figure 1]. The statistical analysis was performed using SPSS version 21.0 (Armonk, NY: IBM Corp). The difference in the distribution of genotypes and alleles were compared using Chi-square tests. Results were analyzed by calculating P value and 95% confidence intervals (CIs). Values of P < 0.05 were considered to be statistically significant. Triglyceride values were log transformed to induce normality of distribution. Haplotype analysis was performed using Haploview version 4.2. Power was estimated using PS Power and sample size program (Vanderbilt University, Nashville, TN, USA) calculations. The clinical and biochemical characteristics of the study participants are summarized in [Table 1]. Participants with PD and diabetes had higher BMI, and Waist-Hip ratio (WHR) compared to the normals but this did not reach statistical significance. Fasting glucose, 2 h plasma glucose, HBA1C, fasting insulin, and HOMA IR observed a significant increasing trend from NGT to T2D. Serum triglyceride levels were also found to be significantly higher in those with diabetes compared to PD and NGT. 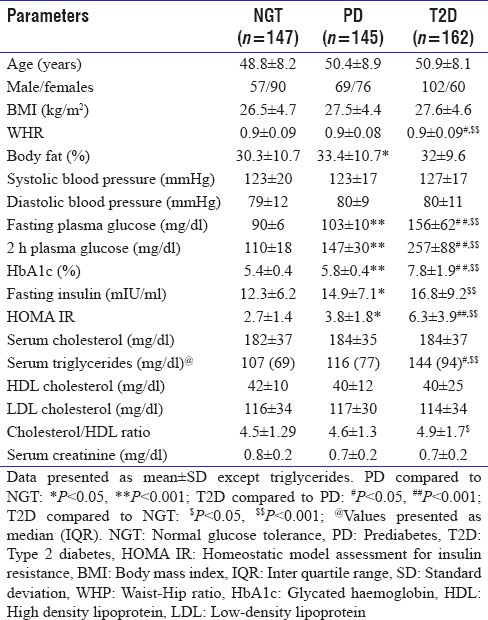 Body fat level was significantly higher in PD when compared with NGT group, and it was also found to be higher when compared to T2D in this study. Three genetic variants in VDR (TaqI, BsmI, and FokI) were determined. The genotype distribution of all the SNPs in the control group was in Hardy–Weinberg equilibrium. The most common genotypes for the TaqI, BsmI, and FokI were TC, GA, and CC, respectively [Table 2], [Table 3], [Table 4]. 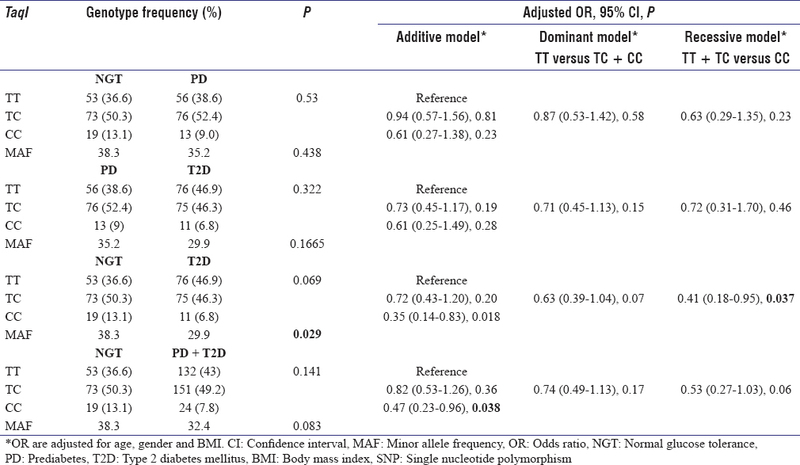 The allele distribution of TaqI gene differed significantly when a comparison was made between NGT (13.1%) and T2D (6.8%) group (P = 0.029) [Table 2]. 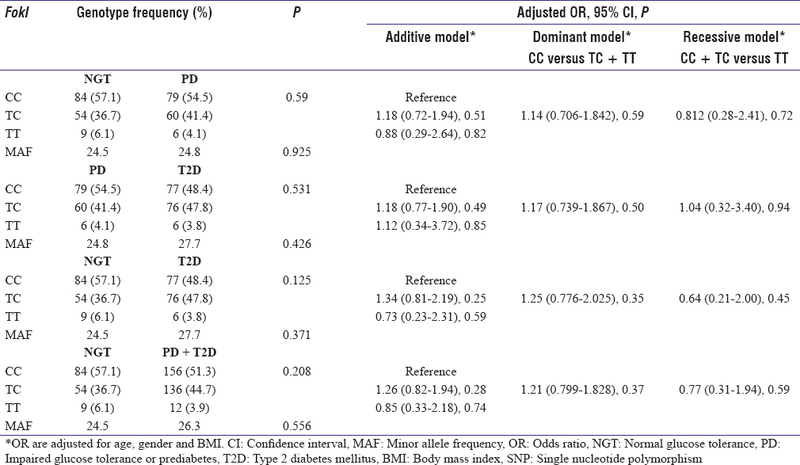 Logistic regression analysis comparing NGT and T2D groups showed that CC genotype of TaqI polymorphism was significantly protective against T2D after adjusting for age, gender, and BMI according to the additive model (odds ratio (OR) =0.35, 95% CI = 0.144–0.831, P = 0.018 and study power 34.2%) as well as recessive model (OR = 0.41, 95% CI = 0.178–0.947, P = 0.037) [Table 2]. 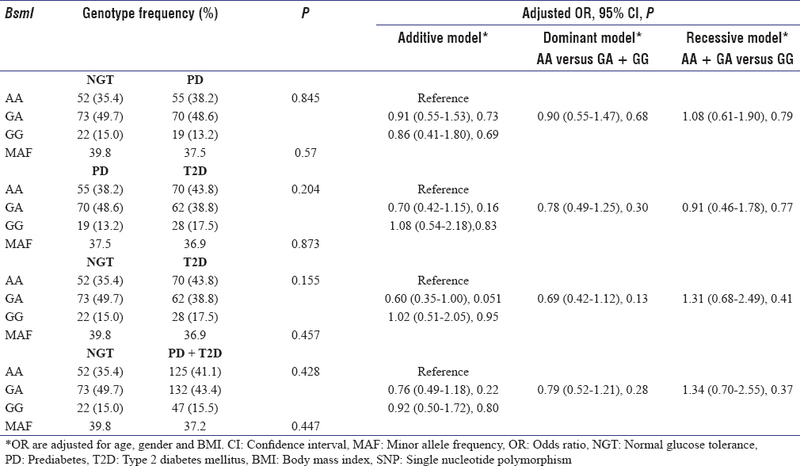 We observed similar results when we combined PD with T2D participants and compared them with NGT participants in both the additive (OR = 0.47, 95% CI = 0.233–-0.960, P = 0.038 and study power 23.7%) but not in the recessive model (OR = 0.53, 95% CI = 0.273–1.028), P = 0.06). In BsmI polymorphism, the GA genotype showed a trend toward association when compared to AA genotype after adjusting confounding factors including age, gender, and BMI between NGT and T2D groups in an additive model (OR = 0.60, 95% CI = 0.354–1.003, P = 0.051) [Table 3]. In addition, we also compared the VDR genotypes with clinical parameters of all the study participants. In NGT group, we observed the levels of HOMA IR, fasting insulin and WHR to be significantly higher in TT genotype when compared to TC + CC genotype (P = 0.013, P = 0.012 and P = 0.006, respectively) where HDL cholesterol was significantly lower in TT genotype when compared with TC + CC genotype of TaqI polymorphism (P = 0.043) [Table 5]. In PD group, the level of 2 h plasma glucose was found to be significantly higher in TC + CC genotype compared to TT genotype (P = 0.005). Serum cholesterol and LDL cholesterol were significantly higher in AA genotype when compared with GA + GG genotypes of BsmI (P = 0.005 and 0.012, respectively) [Table 6]. Based on the r2 values, none of the SNPs seemed to be in linkage disequilibrium. Haplotype analysis was performed for all the three polymorphisms, and none of the haplotype frequencies tested were significantly different between the studied groups. However, the frequency of TAC haplotype of TaqI, BsmI, and FokI, respectively, was higher in T2D (25.3%) when compared to NGT (18.7%) participants. In this study, we examined the association of three VDR gene variants (TaqI, BsmI, and FokI) with PD and T2D. The CC genotype of TaqI was protective to T2D after adjusting for age, gender, and BMI, and further, we observed a significant difference in the minor allele (C) distribution of TaqI polymorphism when compared between NGT and T2D. In addition, we observed significant protection against T2D in the VDR TaqI polymorphism after adjusting for age, gender, and BMI. Several studies showed a significant association of VDR TaqI polymorphisms with T2D,, Interestingly, a recent study in Iranian pregnant women has also found a similar nature of TaqI polymorphism in Gestational diabetes. Several studies showed an association of VDR polymorphisms with clinical and biochemical parameters., We report that the levels of HOMA IR, fasting insulin, and HDL cholesterol and WHR were significantly higher in TT genotype when compared to TC + CC genotype of TaqI polymorphism in NGT group. For comparison, in a previous study, it has been reported that an individuals with the TaqI TT genotypes had higher IR than those with the CC genotypes. Another study in Brazil also showed that VDR polymorphism was associated with HOMA IR in those with metabolic syndrome and HDL, triglycerides in individuals without metabolic syndrome and the association of TaqI genotype with WHR has been shown in a recent North Indian study as well. Interestingly in the PD group, the level of 2 h plasma glucose was found to be significantly higher in TC + CC genotype when compared with TT genotype in this study. Several studies suggested a significant association between VDR polymorphisms with glucose and insulin levels. For instance, a study done in Bangladeshi Asians showed a significant association of TaqI polymorphism with insulin secretion and the association of VDR BsmI polymorphism with fasting glucose levels of T2D patients has also been reported previously. The above observations support the role of VDR TaqI polymorphism status on the development of glucose intolerance. In the BsmI polymorphism, on comparing NGT and T2D group, we observed a significant trend of association in the genotype distribution after adjusting confounding factors including age, gender, and BMI. Many studies reported an association of BsmI polymorphism with diabetes and insulin resistance in different ethnic groups., Furthermore, we observed that the serum cholesterol and LDL cholesterol were significantly higher in homozygous mutant genotype AA when compared with GA + GG genotype of BsmI among individuals with PD. Interestingly, one of the previous studies also demonstrated an association of BsmI polymorphism with LDL cholesterol in postmenopausal women. These findings suggest the possibility of BsmI polymorphism in influencing lipidemic parameters. The association of FokI polymorphism with diabetes has been reported in many studies., However, we did not observe any association between VDR FokI polymorphism and the studied groups. In addition, in haplotype analysis, although we did not find the mutant alleles of the studied SNPs to be independently associated with diabetes, the frequency of TAC haplotype including two mutant alleles, A of BsmI and C of FokI were higher in T2D group (18.7%) (P = 0.05). This suggests the role of mutant alleles in increasing the susceptibility to the T2D phenotype. The mutant allele of FokI was found to be associated with the diabetic retinopathy in Han Chinese population, and the mutant genotype of BsmI was found to have a higher risk of insulin resistance in the Malaysian population. The strength of the study is the homogeneity of the examined population. The limitations of the study include small sample size and nonavailability of serum vitamin D levels. This study shows that VDR polymorphisms may influence the levels of glycemic parameters (HOMA IR, fasting insulin) and lipidemic parameters (serum cholesterol, LDL cholesterol and HDL cholesterol) and WHR. In particular, The TaqI polymorphism offers protection against T2D in this Asian Indian population. Future studies could look at the relation between vitamin D, VDR polymorphisms and vitamin D binding protein and T2D and the metabolic syndrome. This work was supported by a research grant from Department of Biotechnology, New Delhi, India. International Diabetes Federation. IDF Diabetes Atlas. 8th ed. Brussels, Belgium: International Diabetes Federation; 2017. Available from: http://www.diabetesatlas.org. [Last accessed on 2018 Mar 24]. Nair R, Maseeh A. Vitamin D: The “sunshine” vitamin. J Pharmacol Pharmacother 2012;3:118-26. Berridge MJ. Vitamin D deficiency and diabetes. Biochem J 2017;474:1321-32. Reis AF, Hauache OM, Velho G. Vitamin D endocrine system and the genetic susceptibility to diabetes, obesity and vascular disease. A review of evidence. Diabetes Metab 2005;31:318-25. Miyamoto K, Kesterson RA, Yamamoto H, Taketani Y, Nishiwaki E, Tatsumi S, et al. Structural organization of the human Vitamin D receptor chromosomal gene and its promoter. Mol Endocrinol 1997;11:1165-79. Uitterlinden AG, Fang Y, Van Meurs JB, Pols HA, Van Leeuwen JP. Genetics and biology of Vitamin D receptor polymorphisms. Gene 2004;338:143-56. Brunetti A, Chiefari E, Foti D. Recent advances in the molecular genetics of type 2 diabetes mellitus. World J Diabetes 2014; 5:128-40. Ortlepp JR, Lauscher J, Hoffmann R, Hanrath P, Joost HG. The Vitamin D receptor gene variant is associated with the prevalence of type 2 diabetes mellitus and coronary artery disease. Diabet Med 2001;18:842-5. Neyestani TR, Djazayery A, Shab-Bidar S, Eshraghian MR, Kalayi A, Shariátzadeh N, et al. Vitamin D receptor Fok-I polymorphism modulates diabetic host response to Vitamin D intake: Need for a nutrigenetic approach. Diabetes Care 2013;36:550-6. Zhong X, Du Y, Lei Y, Liu N, Guo Y, Pan T. Effects of Vitamin D receptor gene polymorphism and clinical characteristics on risk of diabetic retinopathy in Han Chinese type 2 diabetes patients. Gene 2015;566:212-6. Malik R, Farooq R, Mehta P, Ishaq S, Din I, Shah P, et al. Association of Vitamin D receptor gene polymorphism in adults with type 2 diabetes in the Kashmir valley. Can J Diabetes 2018;42:251-6. Bid HK, Konwar R, Aggarwal CG, Gautam S, Saxena M, Nayak VL, et al. Vitamin D receptor (FokI, BsmI and TaqI) gene polymorphisms and type 2 diabetes mellitus: A North Indian study. Indian J Med Sci 2009;63:187-94. Abbasi F, Blasey C, Feldman D, Caulfield MP, Hantash FM, Reaven GM. Low circulating 25-hydroxyvitamin D concentrations are associated with defects in insulin action and insulin secretion in persons with prediabetes. J Nutr 2015;145:714-9. Liao S, He J, Li X, Xu H, Liu X, Zhao Y, et al. Association between VDR gene polymorphisms and HOMA index for prediabetes in Ningxia. Wei Sheng Yan Jiu 2016;45:184-8. 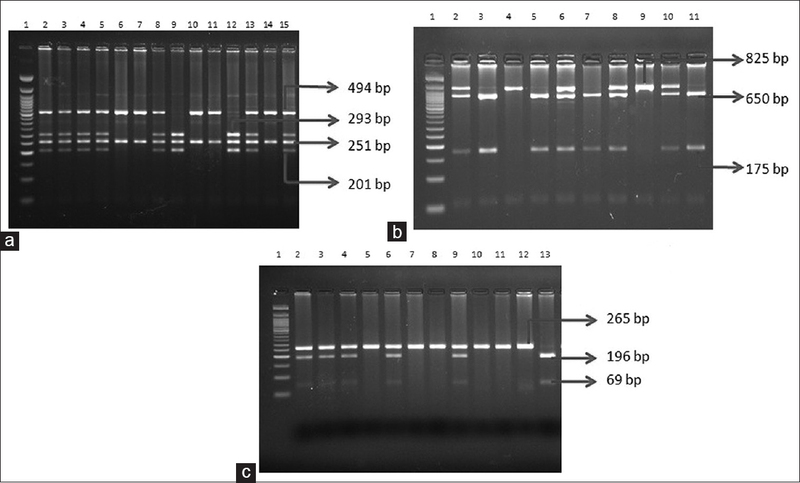 Shab-Bidar S, Neyestani TR, Djazayery A. Vitamin D receptor gene polymorphisms, metabolic syndrome, and type 2 diabetes in Iranian subjects: No association with observed SNPs. Int J Vitam Nutr Res 2017;86:71-80. Malecki MT, Frey J, Moczulski D, Klupa T, Kozek E, Sieradzki J. Vitamin D receptor gene polymorphisms and association with type 2 diabetes mellitus in a polish population. Exp Clin Endocrinol Diabetes 2003;111:505-9. Harris SS, Eccleshall TR, Gross C, Dawson-Hughes B, Feldman D. The Vitamin D receptor start codon polymorphism (FokI) and bone mineral density in premenopausal American black and white women. J Bone Miner Res 1997;12:1043-8. Morrison NA, Qi JC, Tokita A, Kelly PJ, Crofts L, Nguyen TV, et al. Prediction of bone density from Vitamin D receptor alleles. Nature 1994;367:284-7. Al-Daghri NM, Al-Attas O, Alokail MS, Alkharfy KM, Draz HM, Agliardi C, et al. Vitamin D receptor gene polymorphisms and HLA DRB1*04 cosegregation in Saudi type 2 diabetes patients. J Immunol 2012;188:1325-32. Rahmannezhad G, Mashayekhi FJ, Goodarzi MT, Rezvanfar MR, Sadeghi A. Association between Vitamin D receptor ApaI and TaqI gene polymorphisms and gestational diabetes mellitus in an Iranian pregnant women population. Gene 2016;581:43-7. Filus A, Trzmiel A, Kuliczkowska-Płaksej J, Tworowska U, Jedrzejuk D, Milewicz A, et al. Relationship between Vitamin D receptor BsmI and FokI polymorphisms and anthropometric and biochemical parameters describing metabolic syndrome. Aging Male 2008;11:134-9. Schuch NJ, Garcia VC, Vívolo SR, Martini LA. Relationship between Vitamin D receptor gene polymorphisms and the components of metabolic syndrome. Nutr J 2013;12:96. Jain R, von Hurst PR, Stonehouse W, Love DR, Higgins CM, Coad J. Association of Vitamin D receptor gene polymorphisms with insulin resistance and response to Vitamin D. Metabolism 2012; 61:293-301. Ogunkolade BW, Boucher BJ, Prahl JM, Bustin SA, Burrin JM, Noonan K, et al. Vitamin D receptor (VDR) mRNA and VDR protein levels in relation to Vitamin D status, insulin secretory capacity, and VDR genotype in Bangladeshi Asians. Diabetes 2002; 51:2294-300. Ortlepp JR, Metrikat J, Albrecht M, von Korff A, Hanrath P, Hoffmann R. The Vitamin D receptor gene variant and physical activity predicts fasting glucose levels in healthy young men. Diabet Med 2003;20:451-4. Tworowska-Bardzińska U, Lwow F, Kubicka E, Łaczmański Ł, Jedzrzejuk D, Dunajska K, et al. The Vitamin D receptor gene BsmI polymorphism is not associated with anthropometric and biochemical parameters describing metabolic syndrome in postmenopausal women. Gynecol Endocrinol 2008;24:514-8. Rahmadhani R, Zaharan NL, Mohamed Z, Moy FM, Jalaludin MY. The associations between VDR BsmI polymorphisms and risk of Vitamin D deficiency, obesity and insulin resistance in adolescents residing in a tropical country. PLoS One 2017;12:e0178695.